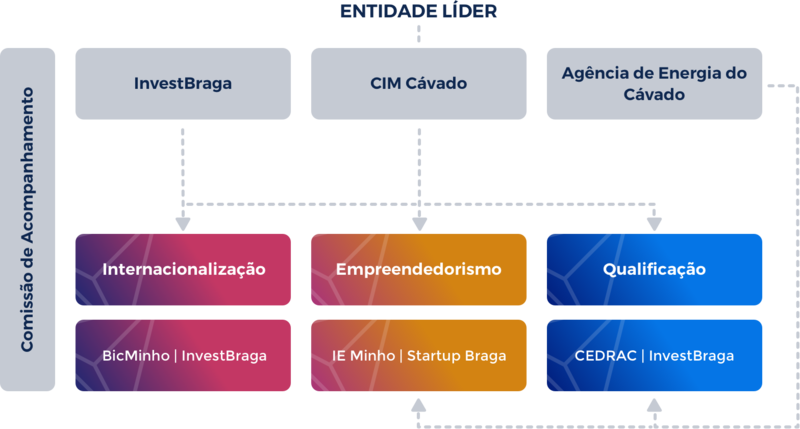 In its essence, UP Cávado aims to mobilize and boost the entrepreneurial spirit, the qualification of the business fabric focused on increasing productivity, the training for internationalization and the increase of visibility and international notoriety of the offer of goods and services of the territory. Promote the entrepreneurial spirit of the territory through the availability of a set of tools, knowledge and information indispensable to the process of undertaking. Enable the existing business fabric through qualification actions focused on increasing productivity and creating value, focusing on the critical factors of business competitiveness. Increase the visibility and international awareness of the supply of goods and services produced in the territory by strengthening the competitive capacity of its companies and their progression in the value chain. Facilitation of networking and internationalization processes.